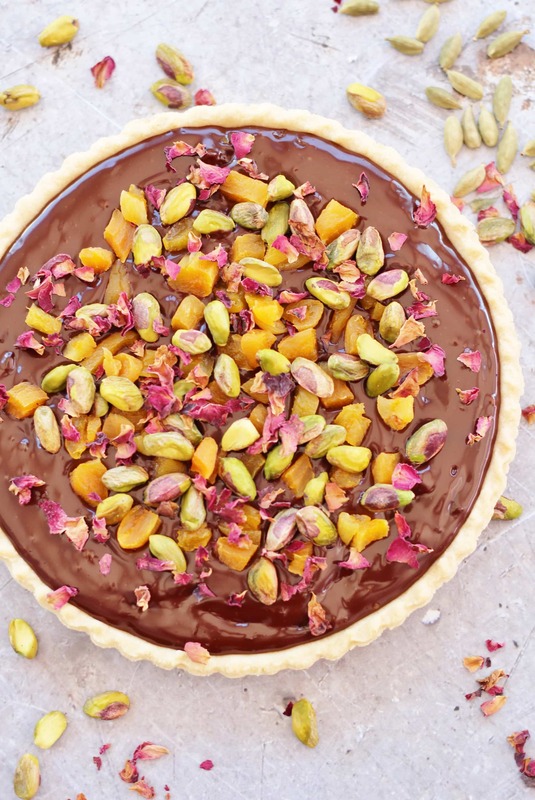 Rich, decadent and totally moreish, this Middle Eastern inspired Chocolate Tart with Cardamom, Apricots and Rose Petals is perfect when you want a showstopping dessert without the hassle! OK, I must admit to having a total obsession with this chocolate tart – it first came into being as my contribution to the Cadbury’s creme egg madness last year in the run up to Easter (you know the one where every blogger, instagramer and tweeter in the land tries to come up with a different way of baking with creme eggs). Then it got reinvented and turned into this gorgeous Christmas version featuring cranberries, pistachios and orange. 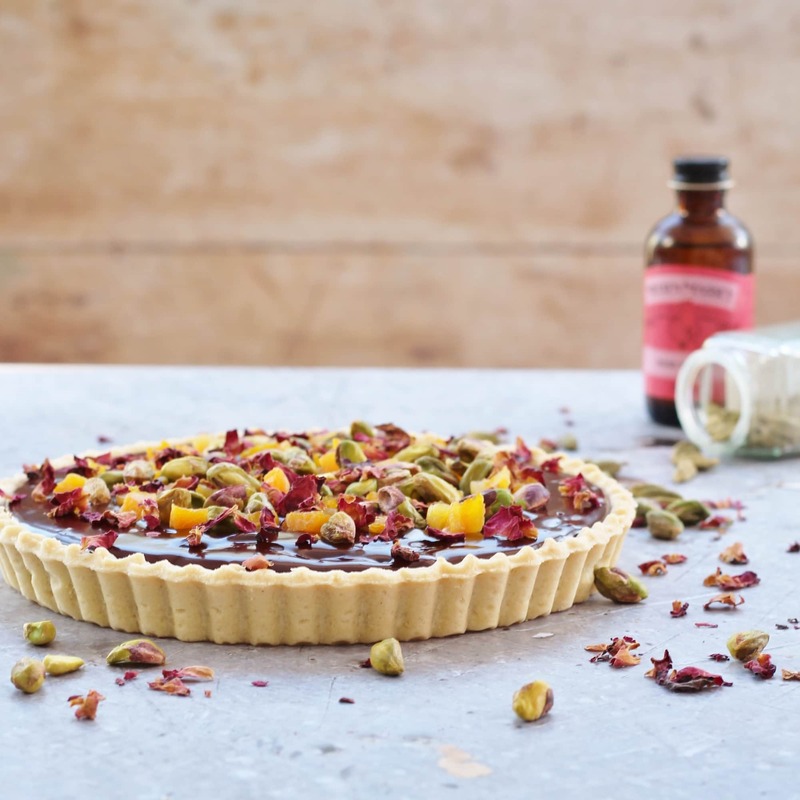 There was even a summer berries version that I totally failed to photograph, so didn’t make the blog…and now I have reinvented it again into this pretty Valentine’s Day tart complete with rose petals – aaah. 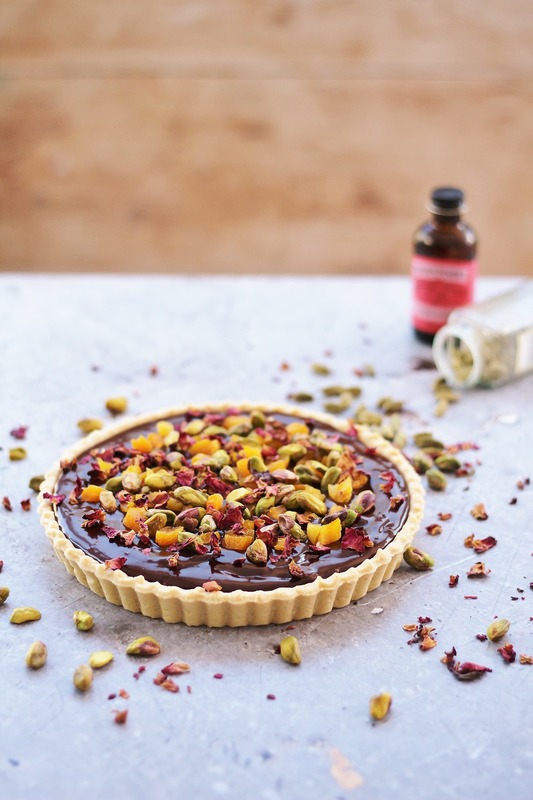 But there is a good reason for my obsession – this chocolate tart is utterly easy peasy, totally foolproof and yet looks and tastes amazing. Meaning you can have elegance and sophistication without the stress! It is perfect for whipping up when you have guests to dinner, taking to a party or just making on a random Tuesday evening, if you so wish! So when I made my Christmas version, I knew I wanted to do a Valentine’s Day version – partly because I knew it would work really well for Valentine’s Day (after all who wants to spend hours in the kitchen on Valentine’s Day?). And partly because I had some rose petals in the cupboard left over from my Moroccan Lamb Traybake, and I wanted to use them up – and what better excuse for rose petals than Valentine’s Day? So I got to thinking – what else can I pair with rose petals? 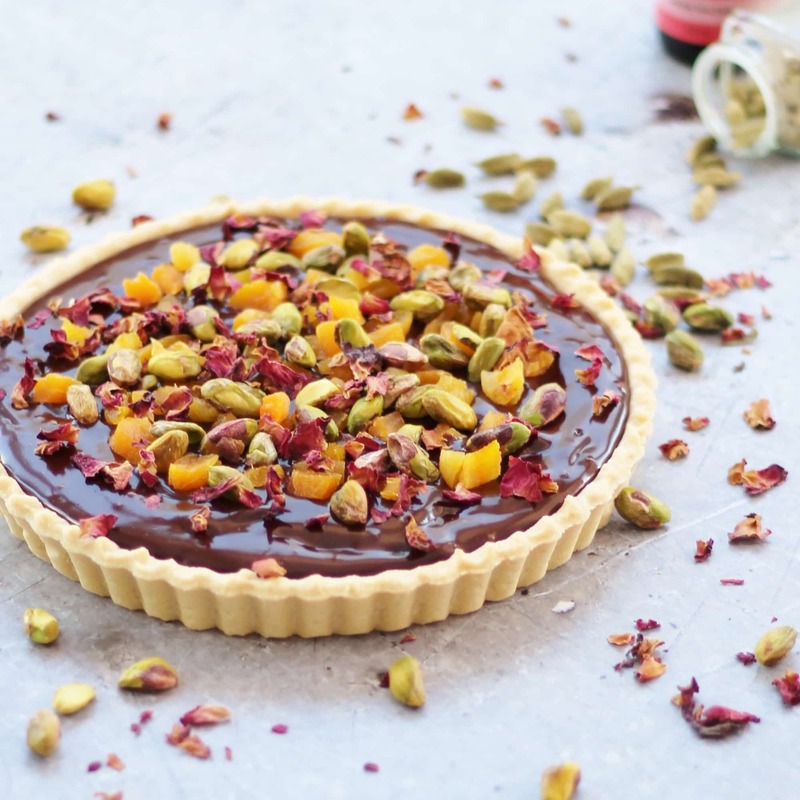 Now to me, rose petals take me to the Middle East – last year I was totally inspired by Sabrina Ghayour’s gorgeous book, Persiana – in it she uses rose petals in several of her desserts and they work so well. The result is as delicious as it looks – a veritable feast for the taste buds – think Turkish delight, but less cloying and more grown up, and you’ve got it! And best of all it takes literally minutes to prepare! Leaving you more time to spend with your loved one on Valentine’s Day. 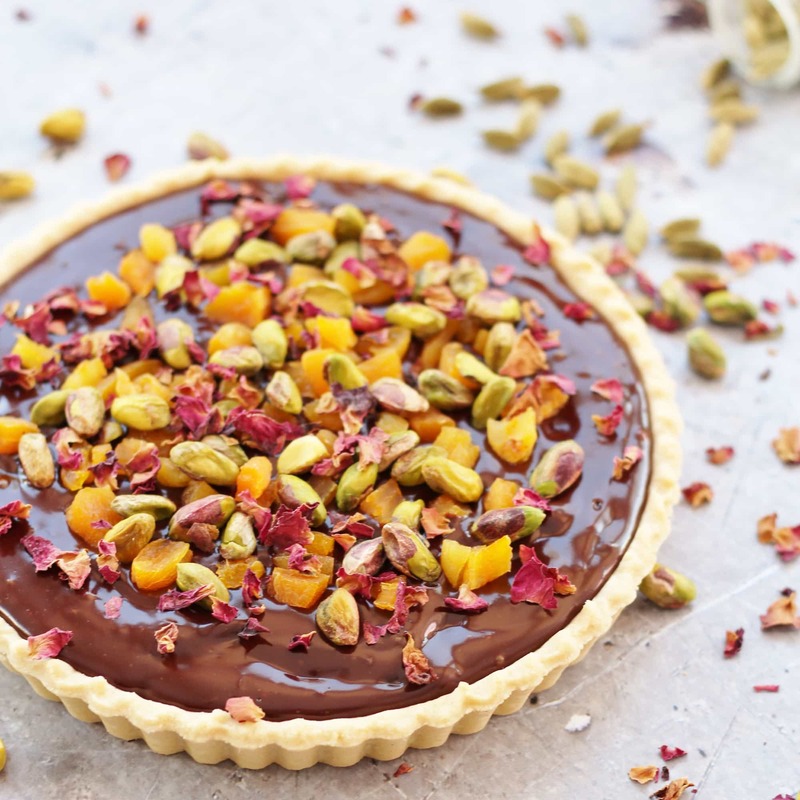 Rich, decadent and totally moreish, this middle eastern inspired Chocolate tart with Cardamom, Apricots and Rose Petals is perfect for Valentine’s Day or any day when you want a showstopping dessert without the hassle! Put the butter and cream in a pan and heat on a very low heat until the butter has just melted. (Don’t allow the cream to boil). As soon as the butter has melted, remove the cream and butter mix from the heat and add in the broken up chocolate pieces. Stir vigorously until it is smooth and glossy and all the chocolate has melted. Add 50g (2oz) each of the dried apricots and pistachios, 2 teaspoons of rosewater and all of the cardamom seeds, and stir to mix thoroughly. Pour the chocolate filling into the pre-made pastry case and smooth over with the back of a spoon. 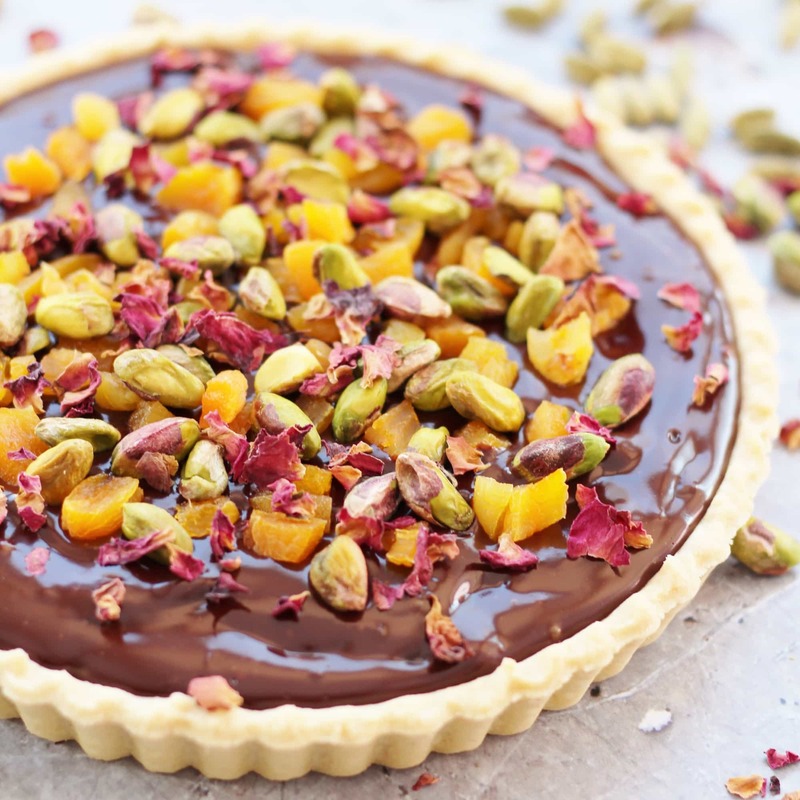 Decorate with the remaining apricots, pistachios and all the rose petals. I am linking this up to We Should Cocoa, Brilliant Blog Posts, Cook Blog Share and Recipe of the Week. OK my mouth is watering. Beautiful photos! By the way, I wanted to leave a comment on your porridge and compote recipe but commenting seems to be turned off! I just wanted to say how lovely it looks and sounds, and to thank you for letting me share it on my Vegan Valentine round-up! Hi Eb, I have to say these photos are gorgeous! Although I haven’t try this recipe yet, I’m pretty sure it tastes amazing just by reading all the ingredients. I’m gluten-free so I will definitely make a gluten-free version. Thanks for sharing. This tart is epic. I’m totally in love with Middle Eastern flavours. Cardamom is one of my favourite spices and rose is just gorgeous. Thanks for sharing with We Should Cocoa. Hoping to get the post out later today.